Since I started blogging, I’m doing what I always wanted – trying new things and enjoying myself in the kitchen tremendously. Everyday I’m looking for new recipes, new flavours and textures. And as a result, everyday I’m getting more courage to try things I never thought I would be able to swallow or even think the connection is possible 0_o. Cookies started me on mexican food and now I like spicier and intense flavours than traditional Polish cuisine that my mom was making. I constantly browse the internet, cooking books and magazines in search for any interesting, easy ideas, though sometimes my genius mind 0_o works overtime and I’m able to create something completely on my own. Don’t understand me wrong, I’m not a chef. I just love to cook and try new things, also I don’t like to spend too much time in the kitchen – I know completely contradicted what I just said 0_o. But this is how I’m always double. Mix the spices: ginger, cinnamon, cumin and cayenne pepper in small bowl. Cut chicken to desirable size – I always cut it horizontally in two cutlets, meaning in the end I have 4 thin pieces of meat and usually 2 little loins. Salt the chicken and spice good with prepared mix – set aside. Prepare mango – seed it and dice it in small cubes. Toss to small pot, add orange or apple juice, lemon juice and honey. Let the mixture get to boiling then reduce heat and simmer for few minutes – 5 maybe. Don’t forget to stir from time to time. In a cup mix starch with water until it’s dissolved. 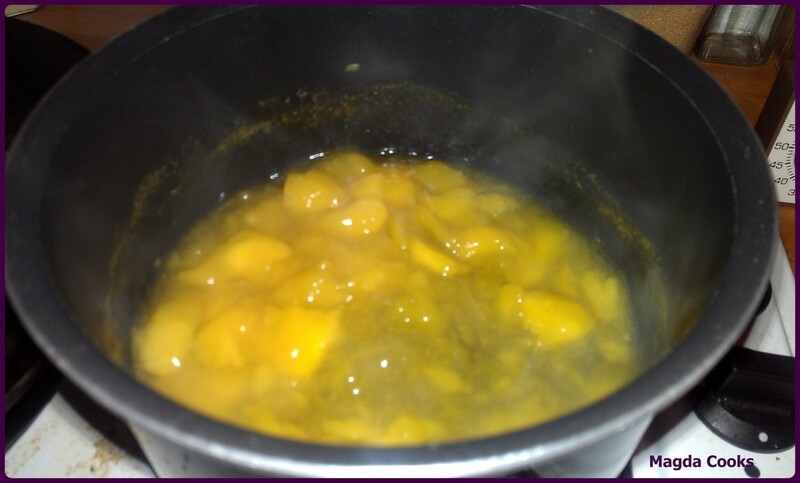 Stir the mixture into the mango pot and simmer for 1 minute until the sauce thickens and looks translucent. Grill chicken sprinkled with a little bit of oil until cooked through. 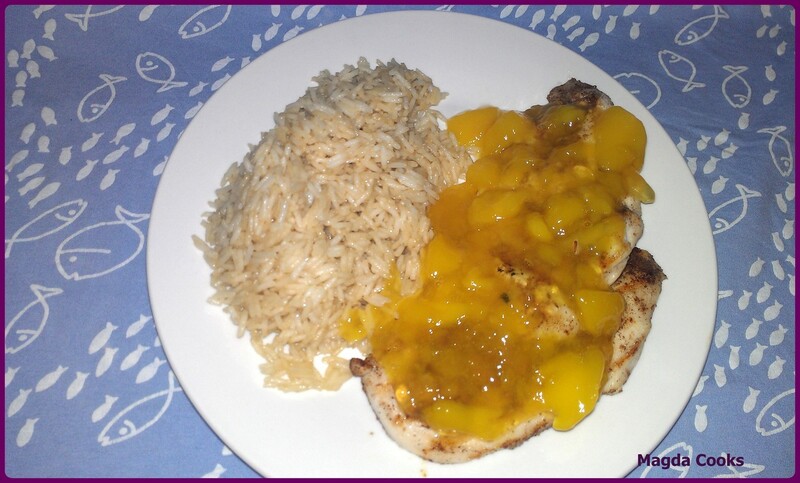 Serve with basmati rice and with hot mango sauce on top. I also served it with the house salad. In: Take the chix out BABES!!! © 2012-2018 All rights Reserved. All material within is property of MagdaCooks™. No part of this blog, including but not limited to images, text, content, or idea maybe reproduced without direct written consent.